It took just about the entire weekend to pick out what I wanted to make with the new yarn my brother gave me. I knew I wanted a shawl so I could show off the colours of the yarn, but I wasn’t entirely sure what to go with. The thought process was unending, it seemed. Do I make another pi shawl? The problem is, you do all that effort, and unless it’s used as a blanket, half that work is never seen. I’ve not done any other shapes. I’ve heard the half pi shape is nice and that the hexagonal-ish one stays on your shoulders really well. I scrolled through Ravelry every moment I had. Sounds obsessive, I know. I just really wanted to get started. I’m so happy with what I picked. I decided to go with the Afternoon Tea Shawl by Helen Stewart. It’s so beautiful and so easy to do. I wasn’t entirely sure how a half pi shawl would work, but it’s a lot easier than I expected. I still started in the “centre” of the circle with a few stitches and worked my way out from there. I’ll have to sit down with the pattern and figure out some measurements. Not being a little girl by any means, I’ll need to adjust the pattern so it wraps nicely around me. I started work on the shawl yesterday before going to a friend’s for a cookout, where I ate entirely too much. It was fun, though my hands were itching to get back to the knitting. We didn’t get home until late, so there was no more knitting last night. I’m hoping to spend a couple of really solid hours working on it this evening, as well as catch up on my housework. That will all work as long as I don’t get distracted by my new toy: an Amazon Kindle Fire. My husband bought me the Kindle Fire as a belated birthday present. We were going to go shopping on Saturday to decide which e-reader or tablet would be best. My Nook, oh my, I could tell you stories. For one thing, the Nook I have now is my third one. The first one we bought while on a visit to South Dakota and just before heading home to Texas. I was going to read from it on the really long drive. Well, the touch screen never worked. So, we took it back the next morning and received a replacement one. The second one worked for a few hours, but then it decided to freeze at the start-up screen and never fully turn on. We waited until we were in Fort Worth to trade that one in. The third one is just so slow (always was) and never responded very well. When it didn’t want to turn on the other day, I didn’t feel like fighting it. It could just stay off. Deciding what tablet to buy was the big thing. In the end, the iPad was too big to read in bed comfortably and just too expensive. The Android Fire had all the features I wanted. So far, I’m really enjoying it. I was able to bring up my shawl pattern and zoom in on each row’s instructions. No more using the iPhone to read patterns! It’s great. I haven’t done much reading yet, but I’m still having too much fun with the toy aspect of it all. I do appreciate it for knitting, though. Beautiful color of the yarn, and a lovely pattern. 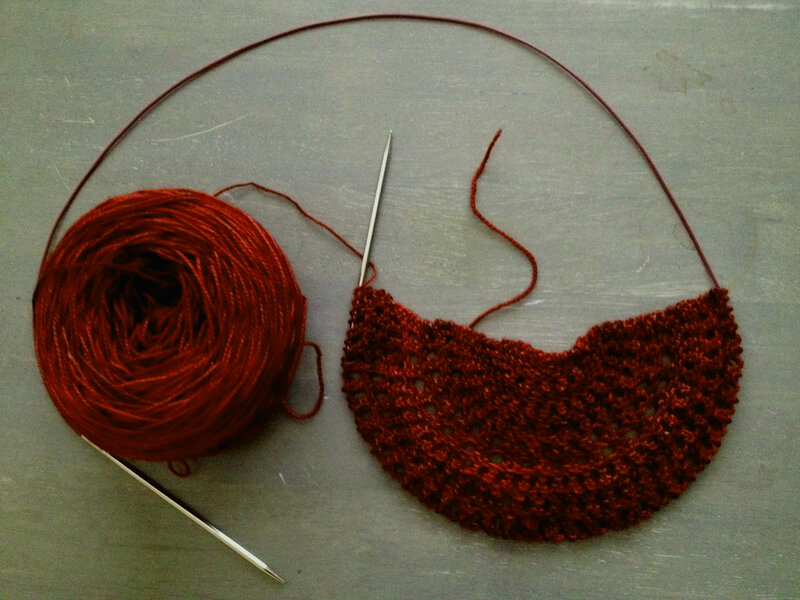 Having never completed a pi or half pi shawl, I look forward to seeing updates on your progress.